General name for a system of privileges "securing the administrative independence of municipalities," which was adopted in many parts of Germany, Poland, and Bohemia ("Encyc. Brit."). Usually it was introduced into the Slavic countries at the instance and for the benefit of the German merchants and artisans, who formed the most important part of the population of many cities. 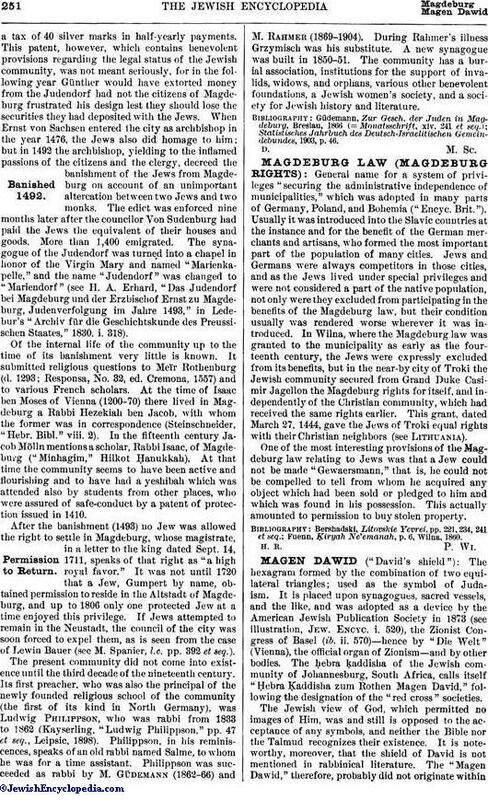 Jews and Germans were always competitors in those cities, and as the Jews lived under special privileges and were not considered a part of the native population, not only were they excluded from participating in the benefits of the Magdeburg law, but their condition usually was rendered worse wherever it was introduced. In Wilna, where the Magdeburg law was granted to the municipality as early as the fourteenth century, the Jews were expressly excluded from its benefits, but in the near-by city of Troki the Jewish community secured from Grand Duke Casimir Jagellon the Magdeburg rights for itself, and independently of the Christian community, which had received the same rights earlier. This grant, dated March 27, 1444, gave the Jews of Troki equal rights with their Christian neighbors (see Lithuania). One of the most interesting provisions of the Magdeburg law relating to Jews was that a Jew could not be made "Gewaersmann," that is, he could not be compelled to tell from whom he acquired any object which had been sold or pledged to him and which was found in his possession. This actually amounted to permission to buy stolen property. Fuenn, Ḳiryah Ne'emanah, p. 6, Wilna, 1860.